I’ll be the first person to tell you, I don’t respond well to getting Facebook messages from independent consultants. I find it tacky. And don’t get me started on getting 1000 invites to online parties. I see that you use the products and if I have a question or interest, I will let you know. I also wish people would pay attention to the lifestyles of the people they’re accosting. Ie. I run a healthy lifestyle blog that promotes diet, exercise and self-love… I’m probably not going to buy or want to sell a wrap to make my stomach smaller. Yes, we all want financial freedom and many of us work full time jobs AND have a Girl Boss Side Hustle that we’re monetizing, but dollar signs should not precedeÂ integrity. If an MLM talks about how much money they make before talking about their actual products, I’d probably steer clear. You should whole-heartedly adore the products and any income you make off of them should be secondary awesomeness. If you love and use a product, why not promote and sell it on your blog? My first tip is:Â Become a product of the product so that your promotion is sincere. 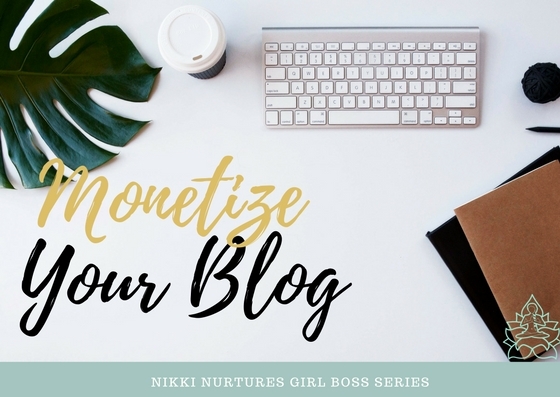 I recently added Arbonne as a means to monetize my blog. I’ve used the products before. I love the skincare line. I also love that the products are ethical and vegan. It perfectly fits with my personal lifestyle and the message of my blog. If i’m going to influence someone to buy something, it’s going to be because I really do use it and it has my stamp of approval. As a blogger, you have a unique platform to be completely transparent. Hopefully, you have multiple social media channels that mirror your blog and you post content regularly. My second tip: Let people know you offer these new products, but don’t beat them over the head with it. A post every so often will give you lots of visibility, and like I said, the people who are interested will come to you. So, if you don’t like the standard practice of having to reach out to strangers, don’t worry. Your content will do the work for you. If you’re a service based blogger, this may be the perfect addition. What do I mean? Well, If you’re a makeup artist, esthetician, manicurist, or anything beauty industry related– try using and selling for a brand. I would be lying if I told you I used all Arbonne products, so I don’t expect a makeup artist to only use one brand, but hey…. maybe you love Younique lipsticks and you use them on clients. If your client asks you what brand and where to get it… you’ve just made a sale on a product you already believe in. See how that works?! That’s making an MLM work for you, not the other way around. This leads me to my third tip: Don’t be a one trick pony. Make sure you bring more value to people’s lives than just slinging product at them. My last tip is for growing your network…. Surround yourself with those who are doing what you’re doing. Stephanie Nielsen of Tangerine Desert is who first approached me about adding Arbonne to my blog. I was comfortable with this and felt her sincerity for doing so because we’re both lifestyle bloggers with similar missions. So, if you’re going to reach out to someone to join your team, look into how they represent themselves and their blog. It’s better to have a small team with integrity, than a big team of people who don’t mesh well together. Arbonne offers skincare, bath and body, hair, sun, makeup, and nutritional products that are naturally based, ethical, and vegan. For those who do not wish to join the business, they offer a Preferred Client membership. Preferred Clients receive 20% off. It is a $20 registration fee/$20 yearly renewal fee. If you’re interested in adding Arbonne to your blog, click here. Thank you for reading! Please follow me on social media for daily inspiration, motivation, and a little bit of sass. These are great tips. I never write about a product I haven’t used or like. If I try something and I don’t like it I tell the sales rep that asked me to review. If they are ok with it I’ll tell you what I do or don’t like about it. Thanks for sharing your knowledge and helping others. I totally agree with this as well. If you use and love a certain product, promote it on your own blog. I like that Arbonne is vegan and ethical. This would be a product that I would be happy to promote myself. I have been sent items for review and had to contact the Rep and let them know I could not publish a review for them based on my experience with the product. I tend to shy away from reviews unless it is a product we use and believe in. Thanks for the tips. I am all for promoting products that I use and love. I will have to check out Arbonne. I’ve heard so many good things about Arbonne. I totally agree that you should only promote products you truly believe in. My readers know I would never write about something I wouldn’t be happy to use myself. Great tips. I need to work affiliate links more it is something I am slacking in for sure. This is a great post. I get approached almost daily by MLM people. I definitely agree that anything you sell should be something you whole-heartedly believe in! I’ve read there’s a ratio of sharing your MLM content to more organic posts, but it’s totally slipped my mind. It does get annoying when your social media feeds are all just ads from your friends trying to convince you to buy their stuff. I want to be supportive, but not overwhelmed. These are all great tips. I think it’s so much more fun and sincere to sell products you truly love for yourself, especially if they’re also good for you as well. I agree, I hate all the online invites. If I love a product I usually mention it several times. These are such great tips! I never thought about adding a product like this but it’s a great idea! I have been wanting to try Arbonne. I think if you find a product you love you should blog about it. I love to learn about new products to try on the blogs I follow. Great tips! I love that you mentioned to not just throw products at people, giving something to them that is useful is so important. It can be tempting to just push things for the sake of money but that takes away from your blog in the long run.